Uses a veritable rep company of friends/actors/people to play characters for photo reference work, most notably himself as Sláine and then as the American Reaper; intricately realized background settings; world building through design; producing photo-realistic looking versions of things that cannot actually be real! Should exist in real life; doesn't. Although he’s worked with other writers, Clint Langley is indelibly linked to Pat Mills. 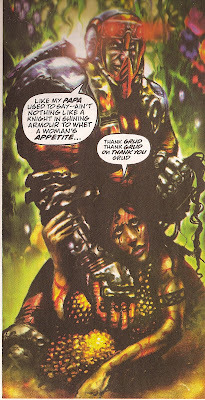 Presumably hand-picked by the artist-loving writer, Langley’s first work for the Prog was Dinosty – a comic intended to run in a junior version of 2000AD known as Earthside 8. This tickles me in that Langley’s style, like Kevin O’Neill’s before him, is one of those that I find to be somehow inherently a bit adult, a bit scary, and basically the sort of thing that management types (certainly at my publisher!) would deem utterly wrong for young children. And so, all the more perfectly suited to the job! Anyway, Dinosty ended up running during that period when fully painted artwork was all the rage. Langley obliged, but added his own brand of earthiness, shininess and something a bit squirmy and ethereal, too. To some extent, he was making the best of a tricky job. Dinosty the story was half a riff on Dynasty – only with dinosaurs as the rich, bored soap characters, and half a riff on Spartacus, about rebellious human slaves looking for a leader to help them throw off the shackles of dinosaur hegemony. Pat Mills, man. Anyway, Langley was obliged to try to make the dinosaur bits funny and the slave revolt bits heroic/serious (but never too serious). His humanoid dino designs were genuinely funny; his over-muscled humans (hello, the 1990s!) a bit odd, but they work OK. Moving onto a monster-based underwater Judge Dredd outing, then a short Nemesis story, with its weird aliens and deliberately odd-looking humans was a natural and worthy progression. source of this panel. Sorry! We were treated to a brief glimpse of Langley the penciller/inker on his first Sláine outing. He’s pretty much very good at it, and you can imagine a different person might’ve stayed on in that vein. Not Clint Langley. A few episodes here and there on things like Sinister Dexter, Outlaw, Tales of Telguuth tided him over, plus a single series outing on Holocaust 12, before he seemed to go quiet. Dabbling with photos in the background. Only to explode back into the Prog as the photo-manipulation guy, and something of a cause-celebre. Whatever your reaction to photo-based art, it’s undeniable that Langley’s tenure on Sláine reinvigorated the character. Time and reprint collections have been kind to mid-period Sláine, which turns out to have been pretty decent overall, just not well-suited to weekly episodes or low(ish) quality printing of the 1990s. But Langley’s Books of Invasions saga – and the wanderings that followed – were a cut above both on their original run, and again on reprint. And in a fairly rapid time, Langley has gone on to be the most prolofic Sláine artist by far (by my count 91 episodes + covers, with Glenn Fabry next on 53), stamping his vision of the character firmly on top of what had gone before. Absolutely nailing the look and feel of the characters, including the way they really do look like father and son. 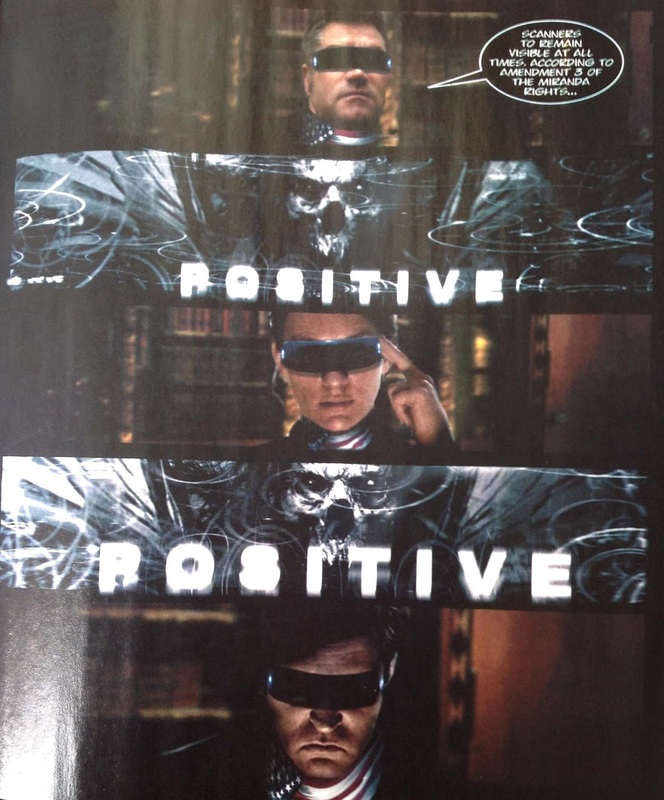 The specific facial expressions are great, too - but the layer of reality still draws me out of the strip just a bit. The effect is worse in some of the talking scenes – it’s just not possible, apparently, to pose two actors, however well rendered, into a scene that feels as fluid as traditionally drawn stuff. The atmosphere is there, but the characters are, for want of a better word, static. But contrast it with s moment of action and scene-setting, and the failings of the first become the mind-blowing art-gasm of the other. The very next page. Same style, but somehow the whole thing is more alive. Even the talking tombs are more alive! Over the years, Langley’s Slaine got better; he grew more confident with his techniques. Slaine: real; Ukko: not real. Violent fumetti: still funny. And then he moved on to a different strip altogether, ABC Warriors. Those early episodes of the Volgan War are simply extraordinary. He transitioned the same photo-style but applied it to characters – the titular robots, that do not exist to be photographed. It's Blackblood. Same as ever, but also like nothing ever before. The Mess as he should be - in a mess. And where Sláine's backgrounds were rocky, organic and to some extent ‘real’, Langley’s visions of a future Mars were hellishly urban. Even better, when human characters show up he’s trying something different. Still clearly actual human models, he’s painted them, adding that necessary layer of character. Kind of shame the actual story used in service to all this wizardry got a bit bogged down in Mills trying to recapture old glories. I feel bad for Zippo – one of the best ‘new’ ABC Warriors visually, but a wooden plank of a character. Langley took advantage of the nostalgia element of later ABCs outings to remind us that yes, he can still rock the pencils and ink as well as anyone. 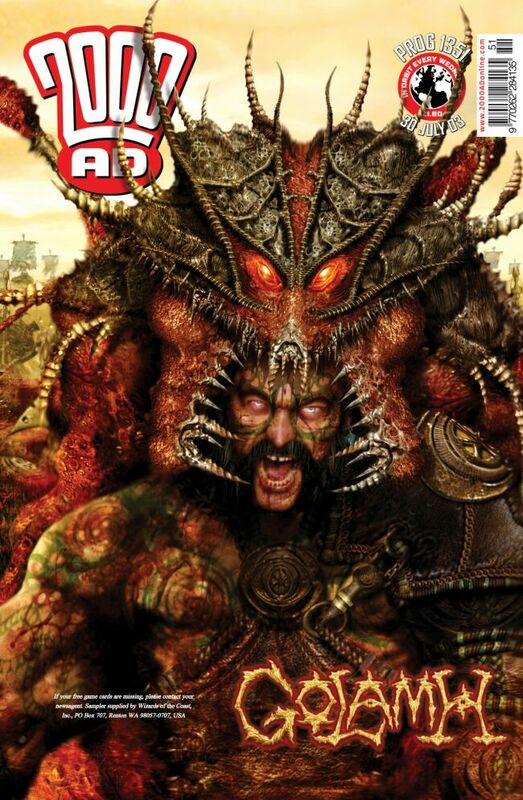 Look, it's the same guy who did Slaine: Lord of Misrule! We can’t ignore American Reaper, the latest Mills/Langley effort. It’s much more photograph-based than anything that has gone before, frankly to the detriment of the story, but given it’s position as something halfway between a comic and an honest-to-goodness movie storyboard, this was somewhat inevitable. There are flashes of Langley genius here and there (and absolutely in the world-building of the story), but for me, it ends as a major example of what the difference is between comics and films. They are different mediums, they need to breathe and move at totally different paces. Langley himself, in the role as the main Reaper, comes across as a decent actor, mind! He knows what he wants from his face and how to get it. Moody and dramatic: yes. Would it be amazing in a film with scary music cutting in: hell yes. Good use of space in a 10-page comics episode: not sure. Langley remains an innovator, and the sort of artist was has mass appeal well beyond the limits of people who mostly just love reading comics. And he’s certainly in that rarified echelon of artists whose output is a) staggeringly fast and b) is massively beyond my understanding of just how he can do it. I mean, I can understand asking people to pose for a photo, but the next step in rendering all the costumes, backgrounds, and other immaculately rendered detail is just insane. Andm to top it all off, he's so invested in his work he goes back to re-do and add in extra pages of sumptuous work to his reprint collections. You get more than you pay for with Clint Langley. Can't end this post without bringing in the eyeball piercing! Or buy his book, why don't you? And a video of him singing an autograph, because why not? 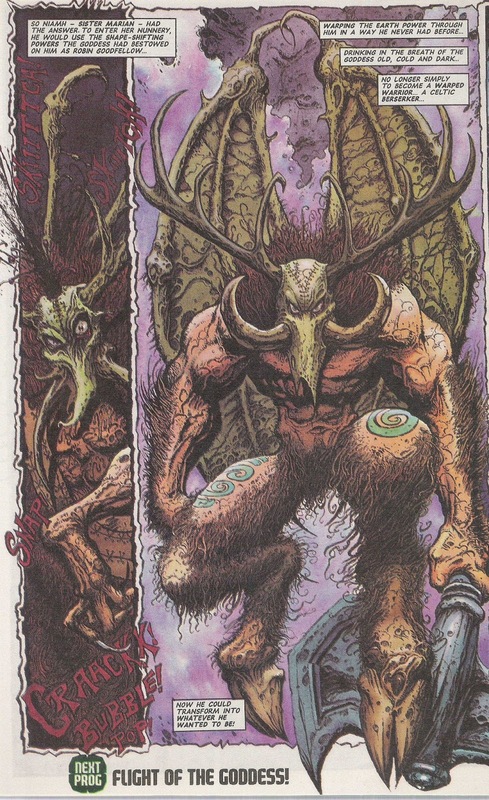 *Not technically a character, but the design for creatures that attach to human hosts, as in Gael from ‘Books of Invasions II’, is pretty darned memorable!